Chris Horne of the Wellington Botanical Society recently sent me a fern frond they collected on one of their trips. Although the frond is small and lacking the diagnostic reproductive characters, I think it is the introduced holly fern (Cyrtomium falcatum). It looks like the shining spleenwort (Asplenium oblongifolium), but the flanges, or ‘teeth’, of the frond segments are distinctive (amongst ferns in New Zealand). 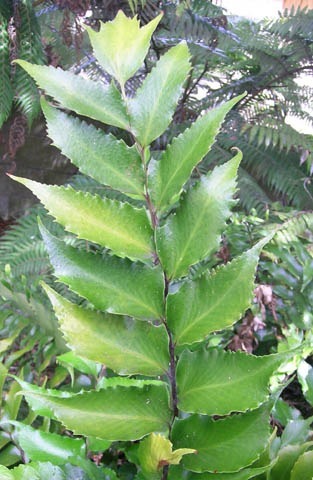 Holly fern, Cyrtomium falcatum, in cultivation. Holly fern and shining spleenwort can be readily distinguished when mature. The reproductive structures of the holly fern resemble those of the shield ferns (Polystichum), to which it is related, while the shining spleenwort has typical spleenwort reproductive structures. The sori, or reproductive structures, on the underside of fronds of holly fern, Cyrtomium falcatum, on the left and shining spleenwort, Asplenium oblongifolium, on the right. Holly fern is native to Asia, but it is sporadically cultivated in New Zealand, and it has become weedy in several parts of the country. Steve Benham wrote an article for the Auckland Botanical Society Journal (v.63 (1), pp.25-27) suggesting gardeners should be dissuaded from cultivating holly fern in the Northland and Auckland regions, because of its invasiveness in that part of the country. It is certainly a fern that should be monitored, so it would be good to get reports of holly fern growing wild. Two other weedy ferns to keep an eye out for are common polypody, Polypodium vulgare, and the male fern, Dryopteris filix-mas. The common polypody, from Europe and Asia, is a common weed on Banks Peninsula, and it has recently been found in Wellington (near Plimmerton) and Marlborough (near Kaikoura and near Hanmer Springs). It looks like the native hound’s tongue, Microsorum pustulatum, but can be distinguished by its frond being dissected right to the stem of the frond. Polypodium vulgare can be a terrible, smothering weed, so it is important that it is stopped from spreading further. Regional Councils should be notified of any additional localities. Fronds of common polypody, Polypodium vulgare, on the left and hound’s tongue, Microsorum pustulatum, on the right. 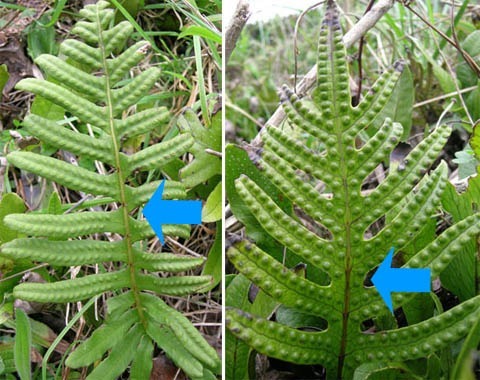 The blue arrows indicate the difference in frond dissection. The male fern, Dryopteris filix-mas, is also from Europe, and has established in many parts of New Zealand. I have been amazed at how widespread it is in the South Island, but I haven’t collected it as often as I should have, and Te Papa’s collections don’t do its invasiveness justice. Male fern is unusual in that it can invade relatively intact native forest, making it a formidable weed. 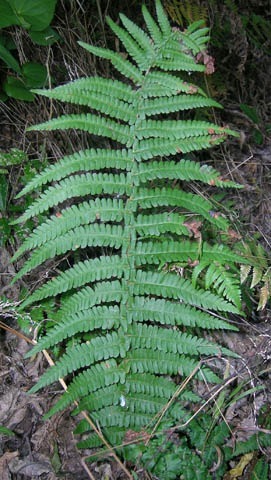 A very similar species, Dryopteris affinis, is also weedy in New Zealand. 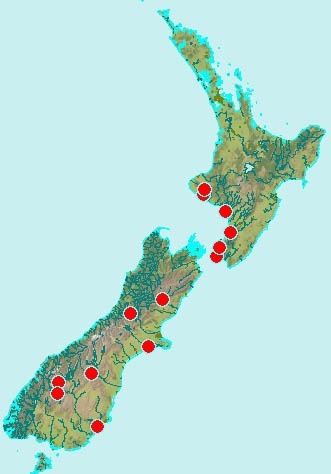 Distribution of male fern, Dryopteris filix-mas, in New Zealand, based on specimens in Te Papa’s WELT herbarium. Note that this is a significant under-representation. I would be interested in reports of these species and other introduced ferns growing wild in New Zealand. This will help us better understand their invasiveness. Please contact me at leonp@tepapa.govt.nz, or 04 381 7261, or Leon Perrie, Te Papa, PO Box 467, Wellington. Te Papa's Blog | What ferns were found during the ‘Find ferns…’ competition? You’re correct in that CHR specimens of D. filix-mas don’t appear to include any from CMS plots. I will be checking with Landcare for plot records later in the year. I was there in October 2003, establishing CMS (now LUCAS) plots. From memory we were in the Clarence river valley. Check recces for records of Dryopteris. It would be advisable to physically check which Dryopteris species is at the site yourself as it could have been incorrectly ID’d. I doubt any vouchers were retained by CHR. It was certainly Dryopteris and very numerous. It was located on river gravels within the flood zone. Which river north of Kaikoura? Under Buddleja, does this mean on very recent river gravels? I am currently collecting records and site information for Dryopteris filix-mas and finding that it is widespread but patchy through the North Canterbury foothills. Often just a single plant but mature plants often have clusters of smaller plants within five meters, suggesting that dispersal is a factor in its current distribution. Otherwise, I have seen it along the Canterbury side of the Lewis Pass Highway, at Murchison, along the Motueka Valley and at Ikamatua. It is reported as well established in Arthurs Pass Village by Hugh Wilson. Dryopteris filix-mas is prolific along the river banks north of Kiakoura (and potentially south). I have observed it as a dense understorey beneath a Buddleja canopy. I’ve sent you a separate email but thought the blog was worth a comment too. The distribution map for male fern is interesting, dry,cold eastern South Island and mild, moist, western North Island, that looks like it could occur in any district. I’m pretty sure I have a record from Nelson in the Grampians along with Pteris cretica which you would also be familiar with in Wellington. I’ll check my records and see where the male fern was,its common enough in North Canterbury. Dryopteris affinis – very similar to male fern, but the smaller segments of the frond have squarish rather than rounded apices. This exotic is, I think, an uncommon fern in NZ. Gully fern, Pneumatopteris pennigera – this is a very common native, often found on damp ground, and it occurs throughout NZ. To my eye, the frond is much more of a yellow-green colour. Also, the veins of the frond segments are very obvious, and the frond is barely scaly (except at the base). Unlike the other three ferns mentioned here, the reproductive structures are unprotected, but you’ll probably need a hand-lens or microscope to check this. Polystichum wawranum (a shield fern)- the stalk of the frond has a dense covering of dark-brown scales, but they are so narrow that they look like hairs. Native to New Zealand, but only known from Otaki-Masterton northwards. The scales of both of the Dryopteris species are sufficiently wide that they are obviously scales rather than hairs, and they are, from memory, a pale brown. Email me a photo if you like; as well as a ‘whole-plant’ image, a close-up of the underside of the frond would be useful.